Prosciutto and Parmigiano Artisanal Food Gift Basket by Manhattan Fruitier with Prosciutto, Parmigiano-Reggiano, Italian Breadsticks, Tunisian Black Olives, and Two Pieces of Premium Fresh Fruit. The best of the best! This gift features prosciutto ham (6 oz.) from acclaimed La Quercia in Iowa. It is air-cured prosciutto that has the texture of silk and the perfect balance of sweetness to saltiness. 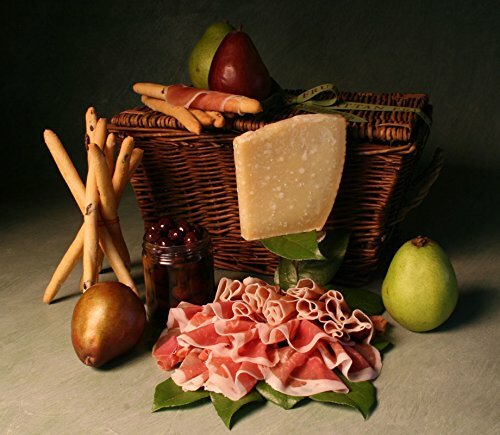 The prosciutto is accompanied by eight ounces of the most prized Parmigiano-Reggiano, Grana d'Oro. Made in the Po River Valley surrounding Parma Italy, the parmigiano is made from the milk of 180 red cows (or vacche rosse) and aged two years. The gift also features Italian breadsticks, Tunisian black olives, and two pieces of premium fresh fruit. If you have any questions about this product by Manhattan Fruitier, contact us by completing and submitting the form below. If you are looking for a specif part number, please include it with your message.